Once upon a time, in 2009, Roger and I decided to try running together in Brooklyn. He'd been running for a few months at school, and I'd been talking about running for a few months while living in Clinton Hill. When he moved in with me for the summer, it seemed only natural that we would run together. This worked approximately twice before I started to ply his will with promises of ice cream if he didn't make me run. Combined with a ton of rain that summer, we didn't really get off the ground. After I moved back in with my parents, I started running again, for real this time, and ran my first race in 2011. By this point, Roger had mostly stopped running, and so I ran by myself, mostly in the spring and summer. Somehow, that changed this spring, when Roger signed up to run the Boilermaker with me. This was months and months ago, and we saw weeks of training time ahead of us, plenty of time to train for nine miles. Flash forward through two episodes of back pain, the world's most stressful semester either for both of us, and a whole lot of Chinese take-out, and here we were about a month out from the race. We decided to buckle down and start training, sometimes waking up at 4:30am to beat the sun and the heat for a few runs. We weren't doing great (most of our runs were about 3 miles each), but we were surviving, and decided to sign up for the Putnam County Classic as a practice race. It's almost as long as the Boilermaker (8 miles), takes place about a week before the race, and is in our hometown, so we figured if we couldn't make it, we could get a lift back to my parents' house and reconsider the Boilermaker. The night before, Dave (who came down from Geneva especially to run with us) pointed out that because we know the course, we could just park at the halfway mark, and if we wanted to go home, we could just drive home then. Genius! We parked at mile 5.5, and then Dave drove us to the start line. At the high school where we met, just before the Putnam County Classic! Our previous runs had been fine, but they were slow (12 minute miles, mostly) and short (no longer than 3 miles). When we started racing, Roger and I pretty much knew we weren't going to make it. But then, an amazing thing happened. We ran all 5.5 miles without any walk-breaks, something I'd never done before. We ran it in 57 minutes (so, 10:30 minute miles). We both felt okay to finish, but decided not to push our luck for the last 2.5 miles, and got into the car. I can't say I wasn't disappointed, because this makes two less-than-stellar races in a row (last year Shelby and I finished in last place - really), and I really love this race, but I was honestly just super-proud that I hadn't walked at all during it, and was glad we respected our limits. I can't wait to try again next year! 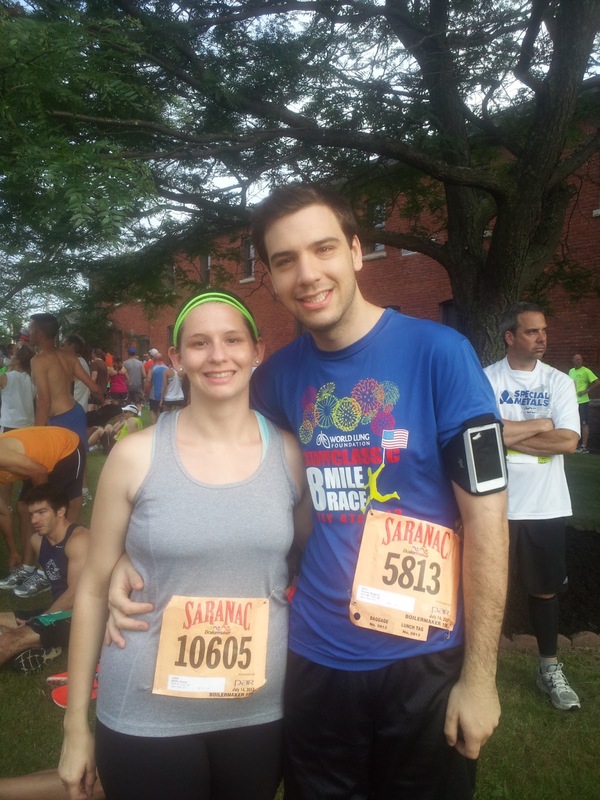 Of course, we kept training for the next week, and while we were both nervous about the Boilermaker, when we headed up to Utica last weekend, I knew we would finish. After picking up our packets (and our pint glasses! ), we spent the day with Dave in Geneva and then headed to Babes with Shelby, Mike, and our family friends for our free pasta dinner. I ran without stopping to mile 6, another record for me, and then, as our family friend had warned us, the race got brutal. mile 6 is a low-grade hill, but it goes on forever, and there's not an ounce of shade. I was stopping at every water stop (and there were tons, thank god!) and dropping ice down my sports bra, but I was just dying. Roger, who doesn't ever take walk breaks, went ahead of me, and though I caught up a few times, ultimately, I knew he was going to have to finish before me and I kept sight of him until mile 7, when I lost him for good. I ran with just increasing walk breaks (though those spectators really don't like walk breaks!) and finally crossed the finish line at 1:52:19, two minutes after Roger had crossed it. We met up with Shelby in the family reunion area, grabbed our beer and a ton of snacks, and then hit the road back home. It was a real blast. Not sure if I'll do it again next year, but I'm definitely thinking hard about it. And in the meantime, it's really nice to have a running buddy in Roger. Just like with everything else in our relationship, he pushes me to be a better version of myself, waking up earlier, running faster, and (yes, really) hydrating better. I couldn't be happier.